Scuttle to the left! Now scuttle to the right! That’s how you do the Herman! Do you love your house? Herman Hermit does – so much so, he brings it everywhere he goes! 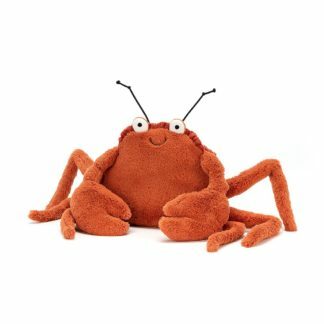 This playful ginger crab is only a nipper, but he’s always off on adventures! Herman’s shelly backpack is made of creamy cord with a soft, suedey edge, and his soft legs and claws have super stitchy joints!